Make a 48 x 48 wall hanging. 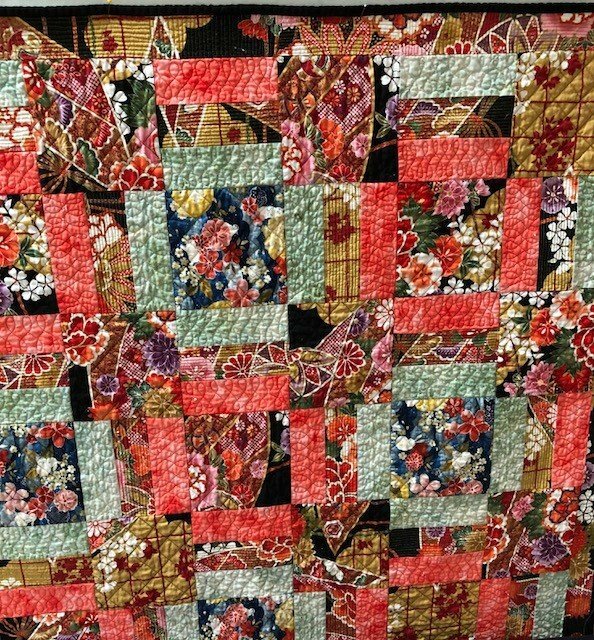 Learn about fabric selection and preparation, rotary cutting skills, piecing techniques, how to baste the quilt "sandwich", hand and machine quilting, and preparing and applying the binding. Sewing outside of class will be required between the 2 sessions. Students will receive a 20% discount on fabric, supplies, rotary cutter, mat and ruler, which will be selected during the first class. NOTE: Children under 18 must be accompanied by a parent who is also taking the class. Requirements: Note paper and pen/pencil or any other note-taking medium of choice. 6" x 24" AND 5" x 5" (or larger square) rotary cutter rulers (thick rulers made specifically for rotary cutting). Rotary cutter and 18" x 24" self-healing cutting mat. Quarter-inch (1/4") patchwork foot. Sewing machine in good working order with power cord, foot pedal, bobbins and needles. Thread that blends with fabrics (cotton or cotton-wrapped polyester). Pincushion and straight pins (long fine ones work best). Fabric scissors and seam ripper.